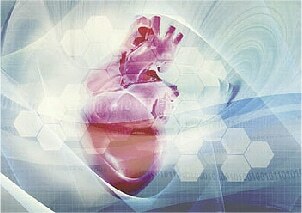 Cardiac biomarkers are substances that are released into the blood when the heart is damaged or stressed. Measurement of these biomarkers is used to help diagnose, risk stratify, monitor and manage people with suspected acute coronary syndrome (ACS) and cardiac ischemia. The symptoms of ACS and cardiac ischemia can vary greatly but frequently include chest pain, pressure, nausea, and/or shortness of breath. Development and utilization of biomarkers has evolved substantially over the past three decades. The earliest biomarkers, such as alanine aminotransferase and lactate dehydrogenase, have fallen out of use with the development of more sensitive and specific assays for creatine kinase isoenzyme MB and particularly cardiac troponin. Cardiac troponin T or I measurements are now considered surrogates for necrosis and myocardial infarction when elevated in the setting of acute cardiac ischemia. The contractile unit (or sarcomere) of striated muscle fiber is composed of thick and thin filaments. The thick filament is composed mainly of myosin. Actin, tropomyosin, and troponin comprise the thin filament. Muscle contraction occurs when the thick and thin filaments slide past each other, thereby shortening the length of the sarcomere. The interaction between the thick and thin filaments is regulated by the troponin complex found on the thin filaments. The troponin complex is composed of three protein subunits: troponin-I (TnI), troponin-T (TnT), and troponin-C (TnC). The calcium-mediated contraction of striated muscle (fast-skeletal, slow-skeletal, and cardiac muscle) is regulated by the troponin complex; contraction of smooth muscle is regulated by calmodulin. Three distinct tissue-specific isoforms of TnI have been identified: two in skeletal muscle and one in cardiac muscle, cTnI, which has never been isolated from skeletal muscle. Within the heart, cTnI appears to be uniformly distributed throughout the atria and ventricles. This absolute specificity of cTnI for cardiac tissue makes it an ideal biomarker of myocardial injury. It is released into the circulation when myocardial injury occurs and has become the basis for a standard test in combination with clinical and electrocardiographic findings for physicians to conduct prompt and effective triage of patients presenting with chest pain. Since the FDA first cleared an assay for cardiac troponin testing in 1996, the number of cTnI and cTnT assays has increased to over 20, in both quantitative and qualitative formats, using both central laboratory and point-of-care testing platforms. Increased cardiac troponin I (cTnI) or T (cTnT) in the clinical setting of ischemia is defined as an acute myocardial infarction and has been endorsed by the European Society of Cardiology, American College of Cardiology, and the American Heart Association. Figure 1. 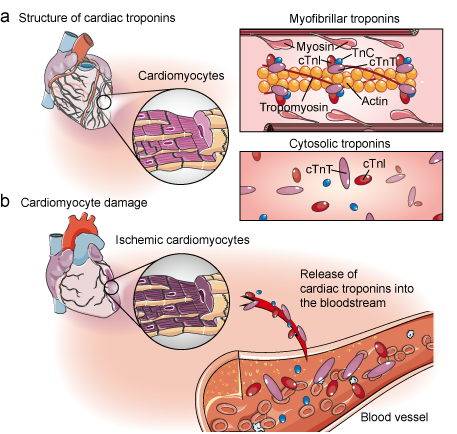 Cardiac troponins and cardiomyocyte damage. Creatine kinase muscle brain (CK-MB), an enzyme that is involved in muscle metabolism, is found in both heart muscle tissue and skeletal muscle, albeit at a much lower concentration in the latter. CK-MB is released into the blood stream when cardiac muscle is damaged, hits a plateau where its levels are highest, and then eventually returns to lower levels. Although CK-MB analysis is currently the benchmark for biomarker detection of MI, similar patterns of CK-MB release can be caused by renal kidney failure, skeletal muscle trauma, and other unrelated ailments. Myoglobin is a hemeprotein found in the cytosol of both cardiac and skeletal muscle. Following the death of cardiac tissue, myoglobin is the first cardiac marker to increase above normal levels in the blood. Myoglobin measurements have proven useful as an early marker for heart attack but other noncardiac-related trauma can also cause circulating levels of myoglobin to increase, so it cannot be used exclusively. High sensitivity CRP (hsCRP) is an alpha globulin that is synthesized in the liver and present as a trace constituent in the blood. Levels of hsCRP rise during general, nonspecific response to a wide variety of diseases, therefore elevated hsCRP is not specific to any particular disease. Despite this limitation, hsCRP is a useful indicator of the inflammatory processes that usually accompany cardiovascular disease and, when monitored in conjunction with the other cardiac biomarkers, can aid in diagnosis.